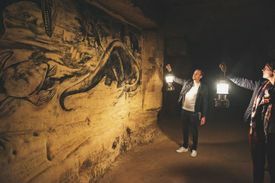 Through a labyrinth that once comprised more than 20,000 corridors, a professional guide takes you underground. The man-made galleries once measured 230 km in total and measure around 80 km today. Highlights of the tour are the big explosion dome, the remains of the 18th century shelter, and many more. Also you will find National Storage Facility no. 9 here, better known as the “vault”. From 1942 to 1945, this space provided protection for a large part of the Dutch national art treasures. The North Caves are very child friendly. For more information on the caves, click here.